I genuinely forgot I had sent this email via FutureMe, but it was a pleasant surprise. Trust my 2009 self to be as cheesy and greeting-card-inspirational-message-sounding as I still am. I learned how to read my Year 11 Maths textbook and have now promptly forgotten 70% of it. Many of the people important to me at sixteen are still important to me at nineteen, for which I am so grateful. The world has certainly changed. The boyfriend remains elusive, but I'm okay with that. 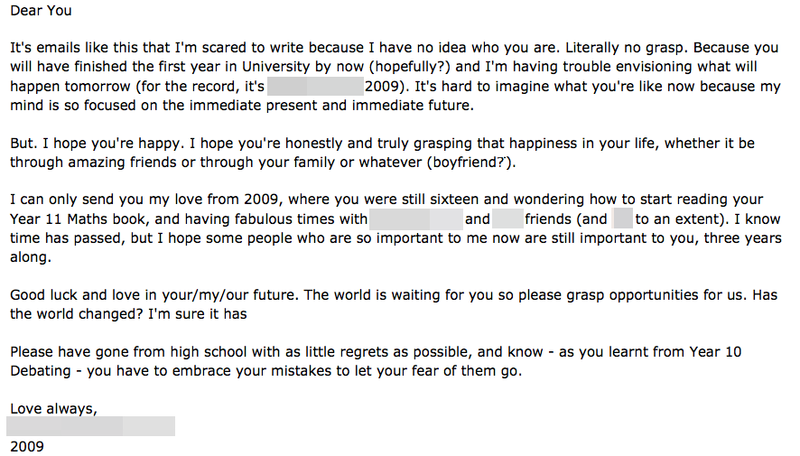 And yes, I did send another letter to my 22-year-old self, 3 years on in 2015. It did get me thinking, more generally, about what a nostalgic beast I am. I am that person. The person who wants to recreate old photographs with everyone in the same position (it was only natural I fell in love with Irina Werning's Back to the Future series). I'm the one who writes sentimental letters to friends instead of cards, every birthday, and basically detail the history of our relationship every time. I send yearly emails to myself that I get around this time in December which makes me extra nostalgic. I even - you're wincing now - take out old primary school class photos if I've seen someone I haven't seen in a long time. You'd think the misty-eyed tendencies should be reserved for old grandparents and, sometimes, so do I. It doesn't do to dwell on the past, after all, and there have been times where I feel like my constant need to look back prevents me from diving into the present and future. At the same time, we're in a world where everything is so easily disposable, replaced and forgotten; it's a constant culture of self-improvement, of 'revamping' the image, keeping up with trends. Erasing history, starting afresh and people always entering and leaving our lives. I like to think of this cheesy, 'old soul' part of myself as someone who knows that people and relationships will always change, no matter how permanent or constant they are or feel now. In preserving the moments that passed, I feel like it stops, just by a little, our memories of that relationship from degenerating. Instead of letting all the old memories be tainted by that angry falling out or having the emotions dry out a bleached, slow death in time, the original emotions linger in the lines of the words, drawings and photographs we created while living those moments. It helps me be grateful for the times that have passed, as much as I know we need to keep moving on.